You wouldn’t believe, the sky here, is so blue this October. A new color scape for my eyes–a perfect, clear blue sky mingling with those browns and yellows and greens–I feel like I’ve never seen it before, like it is brand new. And even though I can’t paint, I wish I could. All my paintings right now would be of the bright green grass and the dark, green evergreens that from afar, look like someone’s quick sketch against the sky, aglow with golden light and foiled so perfectly in this autumn story against the turning leaves of those trees shedding their skin, shaking off the summer in brown and yellow. Wondering, what parts of us are deciduous, which, ever staying? I want to find these exact four colors and paint them like swaths next to each other and hang it on my wall so I never forget how beautiful they were, together, this fall. The perfect combination. By the middle of the day, if I am harvesting, I can strip down to bare my arms to this warm enough, October sun. It is all kinds of glorious. But in the morning,now, I must layer. Wool, warmth, to protect me from the quick intake, the cold breath. It takes time for me to expect, and to want, that kind of greeting from the morning air. But it signals the season, a must. 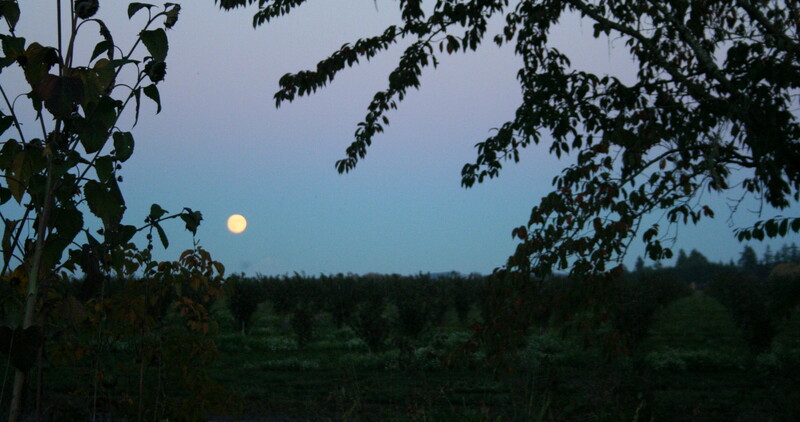 I watch a rotund, Autumn moon rise, and know that the fields are not so full any more, but that I am, filled. There is still a brink, but I am no longer tottering. The kids and I are nearly in our fall groove. It is nice. Moving through life, things change, always. Nothing is static. Every three months, the world here turns itself inside out, a brand new season. And for us, on this farm, that means a brand new rhythm. It is good practice for living, so much change, over and over again, throughout the year. Always moving forward, always changing, but blessed be, always in a circle. Each time around, we know some things, and some things, we don’t. But all this movement, all this circling, it teaches us. We learn the big truth, that we can never just stay put. That life is flux. We know that all we can do at any moment in time is fill ourselves up on whatever is around us, whatever that is. And that we can’t hold onto any of it, that we have to let things keep moving, no matter if we are ready to or want to, or even if we feel like we can”t live with all the letting go. And we learn that even if we want to move on, that adjusting takes a lot of time and energy and is no simple thing. We learn, really, necessity. We know, deep in our bones now, that the deal we make with life is this, forward, forward, around, around, until eventually, we fly off the wheel. No one moment in time contains us. Keeping on is all we can do. We know that holding on and digging deep, that these things only serve us if we accept them as fleeting. That all we have is this. Folding into a warm embrace when we can. Laying down, and deeply tending, roots, that will and can, never hold us. I reckon you could paint that sky beautifully with wet on wet….